MBO field day — BerryCo. 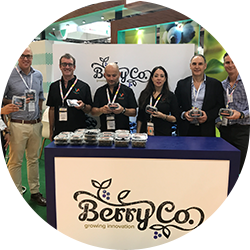 For growers and everyone at BerryCo, it has been exciting over the last few months to watch the first flowers come through as well as gain a better understanding of timing given the geographic spread of plantings in New Zealand. Our planning for the 2017-18 export season to Australia is well underway. Although harvesting of our New Zealand fruit won’t start for a couple of months, Mountain Blue Orchards in Australia has been harvesting for a number of weeks. In the first week of September, the first exports of the Eureka brand out of Australia will be in the Asian markets, ready for consumption by health-conscious shoppers. Our visit to Ridley Bell’s Mountain Blue Farm at Tabulam was an incredible success, with every person in the tour party of 41 leaving Lismore with a deeper appreciation for the Bell operation and a greater understanding of the varieties grown there. Accompanying us was Carol Ward, Zespri’s general manager for innovation, who took the opportunity to learn more about the venture as well as share with us her insights into innovation in the horticulture sector. The full-day itinerary featured sessions covering every aspect of the farm’s operation, including pest and disease management, harvesting methods, plant nutrition, irrigation and packing. Of interest to many was the session describing the numerous varieties that Ridley Bell and his team have successfully bred and grown for export. The tasting table presented to us was the first time some people got to truly experience the various flavour profiles of the different varieties – all of which received a ringing endorsement from growers. From a management perspective, it was very pleasing to see so many people who travelled with us absolutely fizzing about BerryCo and the long-term future and viability of all the varieties we are bringing to New Zealand. The visit also helped people understand the benefits of securing varieties that enable us to be in the market for longer and especially during the shoulder periods of high value. This month I’m attending Asia Fruit Logistica, Asia’s largest trade expo for the fresh produce industry. The event attracts thousands of interested buyers from around the world. Last year was BerryCo’s first ‘outing’ but with interest already high in BerryCo before the event starting, I’m confident our stand will again be a hive of activity. Before departing for Hong Kong, I’ve received enquiries from a wide range of businesses wanting to meet during the three-dayexpo so we’re kicking off our season’s marketing in an encouraging way. This is the first year the summit has been held in China. Blueberry experts from around the world will cover off topics such as market access, technology, global trends, and industry co-operation between China and the rest of the world. This will be a great chance to network with other industry leaders and gain a real insight into China’s production.